Long Beach, CA, July 11, 2013 – Southern California Minority Supplier Development Council (SCMSDC) Chairman Joseph Alderete of Southern California Edison Company and Charles Harmon of Event Title Sponsor American Honda Motor Company presented the 2013 Supplier of the Year (SOTY) Award to Osceola Consulting’s founder, Kevin Narcomey. 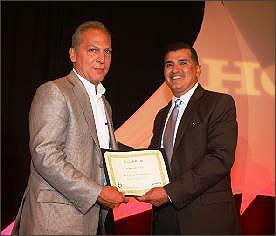 The Award was presented at the SCMBDC’s 23rd Annual SOTY awards luncheon held at the Hyatt Regency, Long Beach. Osceola was nominated for this competitive award by Southern California Gas Company (SoCal Gas). Twelve other firms were nominated in Class II and thirty-two companies overall for SOTY recognition. “Winning this Award recognizes Osceola’s continued growth, development and ability to create jobs, utilization of other MBEs, business performance and community involvement," according to Virginia Gomez, President of SCMSDC. “Osceola Consulting started working with Southern California Gas Company in 2008 as a subcontractor. Their outstanding performance on complex information technology and process reengineering projects consistently exceeded expectations and led to additional business as a prime contractor,” said Andy Carrasco, SoCal Gas Supplier Diversity Manager. “Osceola demonstrates that a small firm can successfully deliver value to highly complex, missioncritical systems integration requirements,” commented Patrick Lee, Senior Vice President, Customer Service, Innovation, and Business Strategy for SoCal Gas. Download Document : Click Here!